Over the last 7 days, the Greater New York Red Cross provided emergency assistance to 82 adults and 39 children following 35 local disasters. Here are some highlights from last week and a preview of upcoming activities (see below). On Friday and throughout the weekend, we held our 4th annual Disaster Ready Summit to provide training to all of our volunteers through courses, workshops, and meet and greets! Click here to view the photos from the event taken by our photographer Kevin Suttlehan. Metro New York North Red Cross ended Red Cross month with a bang by holding a 4-day blood drive at West Point! On Friday, we featured on our blog IT Specialist and recent International Disaster Response Delegate Andy Li, who recently deployed to Mozambique to support the response to Cyclone Idai, as part of our "Three Questions With" series. Read more to learn about his role as an International Disaster Response Delegate, the training he received, and more. On Wednesday, Newsday reported on our Sound the Alarm campaign, highlighting our plan to install 2,000 smoke alarms on Long Island this year. 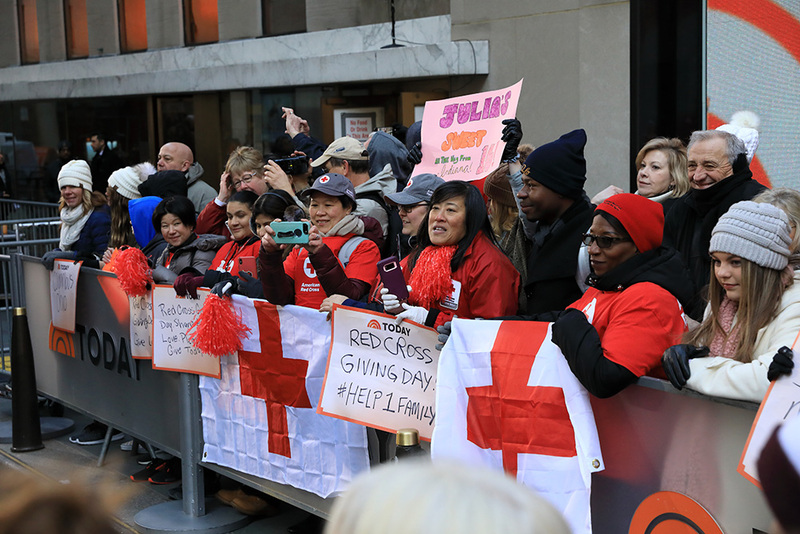 Red Cross went on the Today Show to spread the love on Giving Day. Check out the photos taken by our photographer Gregory White in the album here. CEO Josh Lockwood went on Cheddar TV at the New York Stock Exchange to discuss about Giving Day and how it makes an impact. One World Trade Center, One Bryant Park, and 4 Times Square lit their spires red in honor of Red Cross Giving Day. The Red Cross recorded PSAs with Suffolk County Executive Steven Bellone and Council Member Mark D. Levine as part of the Sound the Alarm campaign to end home fires. On the same day, Red Cross on Long Island received an official proclamation from Suffolk County Executive Steven Bellone as part of Red Cross month. On Monday, our partnership with the New York City nonprofit, Win, was featured on the national Red Cross Facebook page! Through this collaboration, our volunteers are able to bring emergency preparedness education to homeless families. Our Summer 2019 Unpaid Internship Program is open for applications! Red Cross Internships are a rare opportunity to explore and enrich your future career prospects while serving others. Our 10-week Summer Program is open to undergraduate or graduate students. The Program starts Monday, June 3rd. Click here to apply. We are actively recruiting for the following volunteer positions: Volunteer Screener, Home Fire Campaign Team Member, Disaster Action Team Member, and Community Preparedness Education Program Team Member. Apply today at www.redcross.org/volunteer! For more information, please contact recruitmentgny@redcross.org. April 2, 5, 8: Red Cross blood drives will take place from 2 to 7 p.m. at the Greater NY Red Cross building located at 520 West 49th Street, Manhattan. Schedule an appointment to donate today!